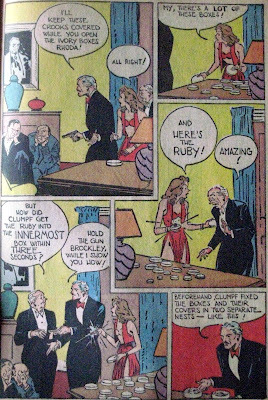 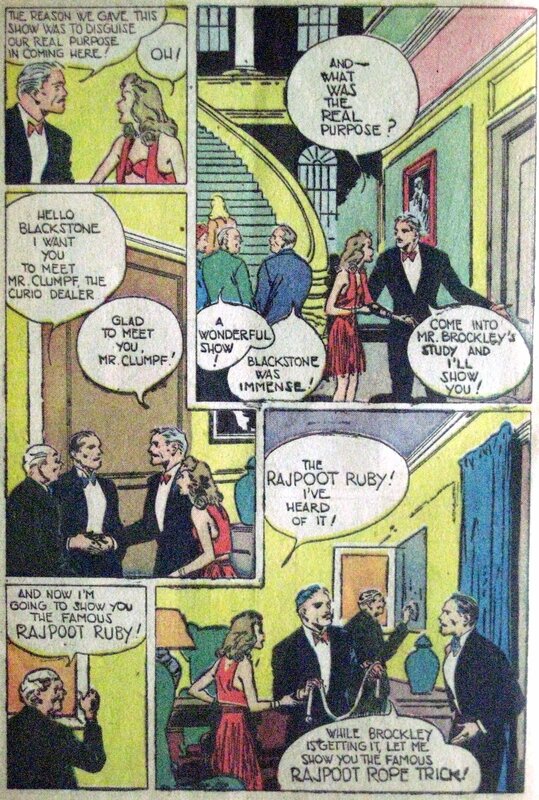 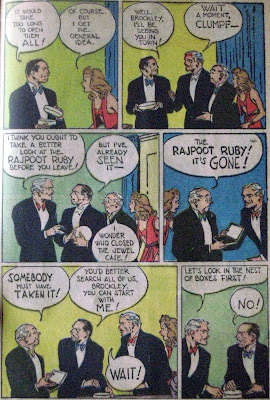 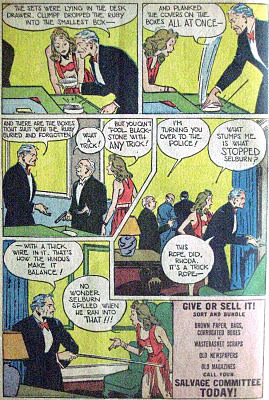 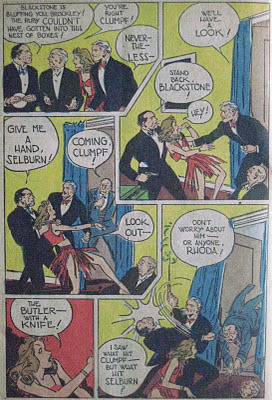 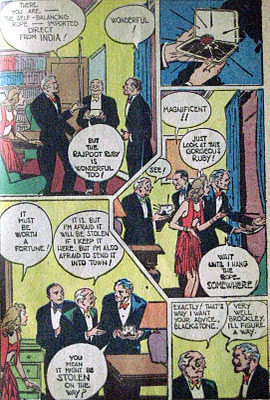 The final installment of Super-Magician Comics #4, vol 4, is "Blackstone Solves the Riddle of the Rajpoot Ruby." 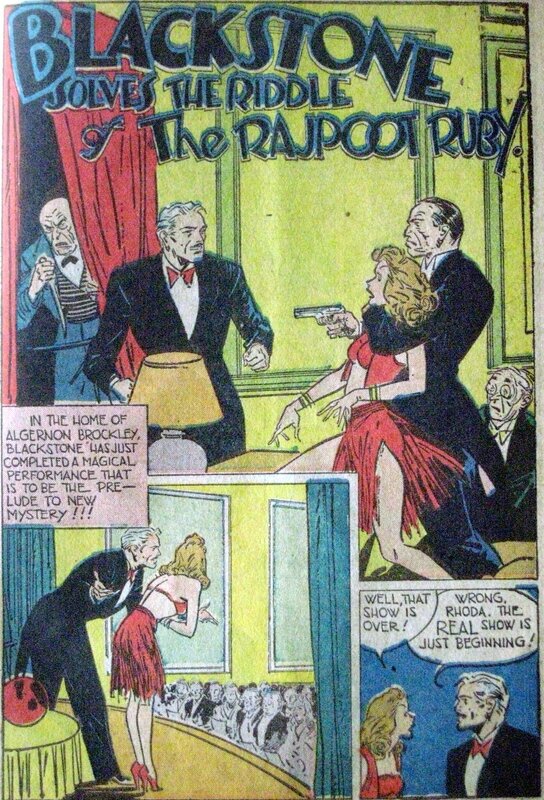 One of the most surprising things about this short story is that all the action takes place in the space of half an hour, and most of it occurs within a single room. 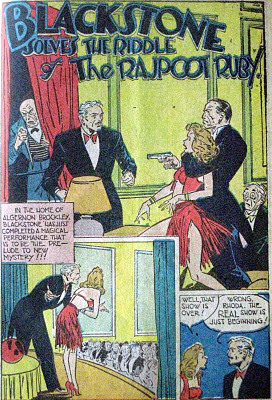 The plot is relatively simple, but it's delivered in a way that's interesting, although I think most people can guess the guilty party before it's half over. Also, keeping with the magician motif, the story also turns around two key magic tricks which are explained in the course of events. At first I thought the title might be a play on the words "Rajpoor Ruby," or "Rajpur Ruby," but Google didn't return anything significant for that phrase. Searching for "Rajpoot Ruby" returned a similarly named Charlie Chan episode titles "Rajput Ruby" from 1957, and a remake in the 80's. In any case, the phrase seemed familiar, but I don't know why. 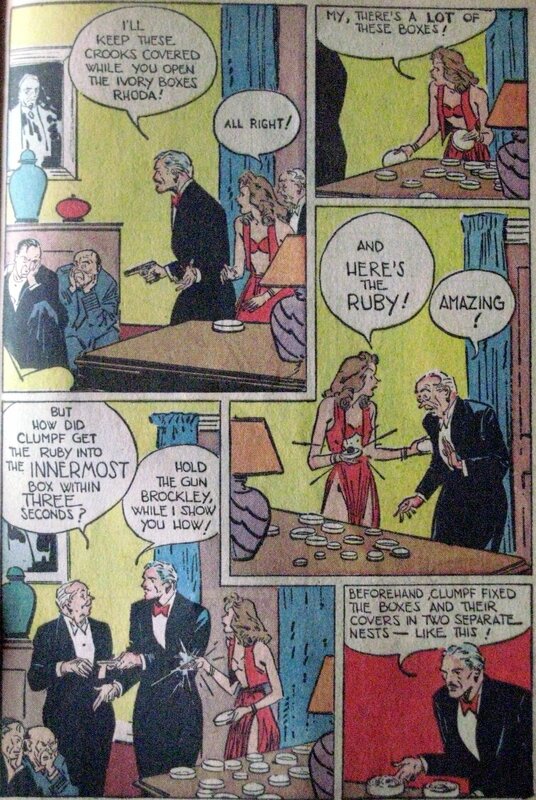 The page layout is similar to the first story in the magazine, but I have a problem with both of them. 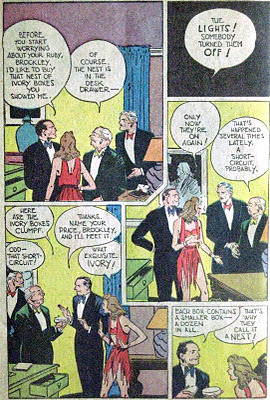 It's odd to read -- going from left to right and top to bottom I'd expect the panel in the lower left to follow the center panel, but sometimes it hard to tell whether it works that way. 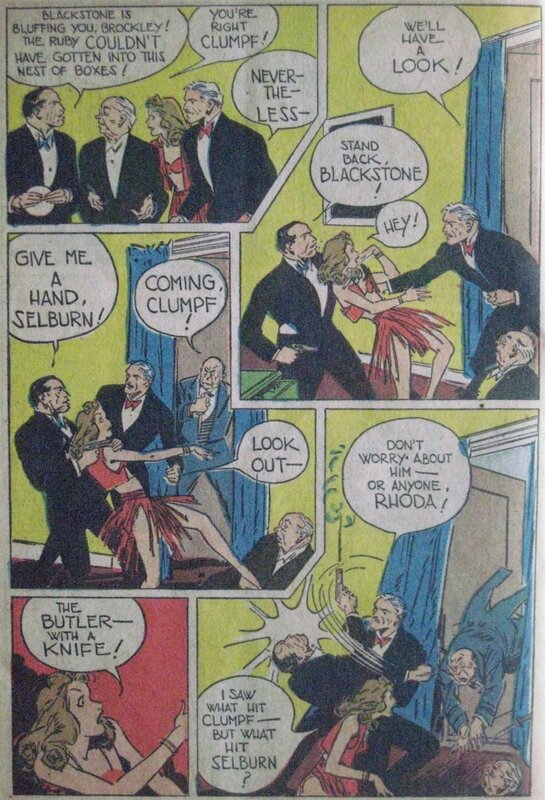 It's almost as if the artists laid out the page panels first without regard to action, and then filled with a corresponding image according to the script. True to form, Rhoda's outfit is extremely skimpy. Check out the ad for war bonds. 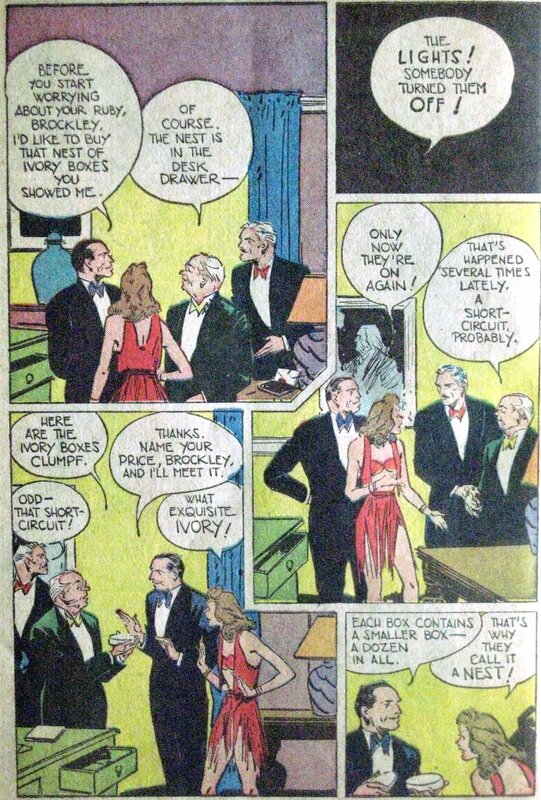 The text starts "Your sons, husbands and brothers who are standing today upon the battlefronts are fighting for more than victory in war. 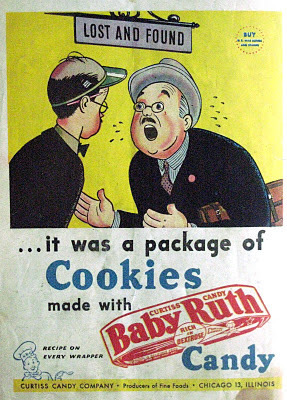 Interestingly, it doesn't add "fathers," which suggests the intended audience for this particular public service announcement isn't children, but adults. 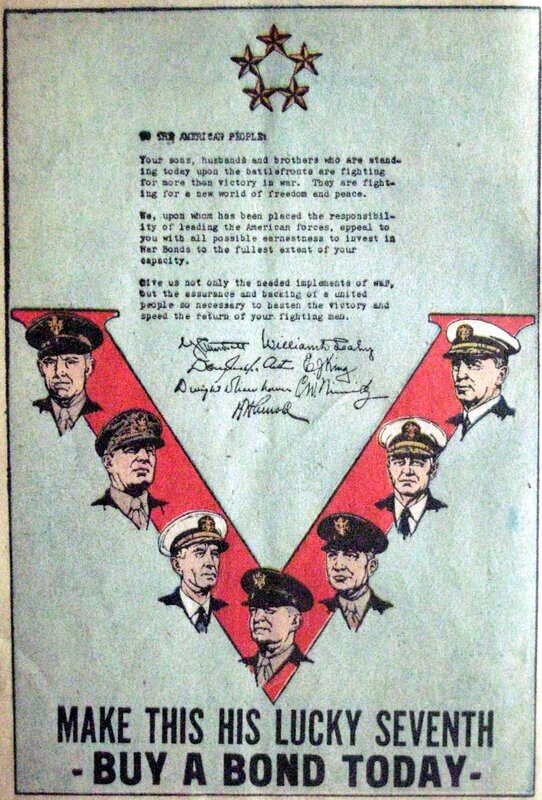 The faces and signatures are of the seven leader of the military, including General Douglas MacArthur, Admiral Nimitz, and future president Dwight D Eisenhower.